What makes and unmakes a Jew? Julian Treslove, a middle-aged bachelor in London, grew up knowing just one Jew: his friend and rival Sam Finkler. Treslove secretly calls all Jews “Finklers” and wonders if he’ll ever understand “Finkler” humor or Middle East politics. While Treslove works as a celebrity double at parties, Sam Finkler is a celebrity—a pop philosopher, television personality, and bestselling author of self-help books. One night, Treslove and Finkler visit their mutual friend Libor Sevcik, a ninety-year-old Czech Jew. Finkler and Libor lost their wives in the same month, and now Treslove feels doubly excluded—he’s not a Finkler or a widower. On his way home from Libor’s apartment, Treslove is attacked and mugged—by a woman who may or may not have mistaken him for a Jew. Could Treslove be a Finkler after all? As Treslove starts acting more and more Jewish, Sam Finkler goes the other direction, founding a group of “ASHamed Jews” who parade their shame of Israeli politics. Libor tries to talk some sense into Treslove and Finkler as they compete over Judaism, women, and Jewish women. But when anti-Semitic violence breaks out close to home, these three friends discover that human differences may be hilarious, but they can also be very dangerous. Howard Jacobson was born in Manchester, England. He is an award-winning writer and broadcaster whose novels include The Mighty Walzer (winner of the Bollinger Everyman Wodehouse Prize), Kalooki Nights (longlisted for the Man Booker Prize), and, most recently, the highly acclaimed The Act of Love. He lives in London. Treslove’s romantic history begins with a fortune-teller’s reading in Barcelona. She says of his future, “I see a Juno—do you know a Juno?” (4) What impact does this prediction have on Treslove’s life? Where does he find “Juno,” and where is he led astray in his search for love? Consider the rivalry between Treslove and Finkler, from school days to adulthood. How did their unspoken competition begin? What “yardsticks of success” (44) do they use to measure each other’s lives? Who seems to be leading in their rivalry at the beginning of the novel? What about at the end? Treslove realizes that after the mugging, he is becoming “an unreliable witness to his own life.” (82) How reliable is Treslove’s point of view in The Finkler Question? Can the reader trust his perceptions? Why or why not? What kind of “Finkler” is Sam Finkler? Is he representative of the Jewish people, as Treslove assumed when he was a boy? Why or why not? Treslove, Finkler, and Libor have all had winding career paths. Trace each man’s job history from his youth to adulthood. Why do you think all three friends have lived such varied lives? Consider the meaning of parenthood in the novel. How did Treslove and Finkler feel about their fathers? How do they treat their own children? What alternatives to family do childless characters like Libor and Hephzibah seek out? Describe Finkler’s rise and fall as the leader of the ASHamed Jews. Why does Finkler insist on publicizing his distaste for Israeli politics? Why does he eventually leave the group? Consider the seder that Treslove attends at Libor’s house. How is this seder unique? How does this scene serve as a turning point in the novel, linking part one and part two? What changes for Treslove during his first Jewish holiday? According to Hephzibah, “You could divide the world into those who wanted to kill Jews and those who wanted to be Jews.” (224) Where do Treslove, Finkler, and Libor fit within Hephzibah’s categories? Is it possible to belong to neither or both categories? In contrast, Libor tells Treslove, “We’re all anti-Semites. We have no choice. You. Me. Everyone.” (249) Which assessment of Jews and anti-Semites is more accurate: Hephzibah’s, Libor’s, or neither? 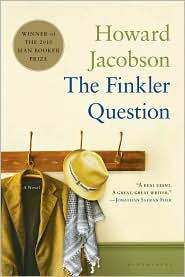 Discuss the role of women in The Finkler Question. What insights do the women in the novel have about their husbands, boyfriends, and ex-boyfriends? What do Treslove, Finkler, and Libor learn from women, and what relationship lessons do they never learn? Why does Treslove tell Libor about his affair with Tyler Finkler? Libor says that it was “more wrong of you to tell me than to do it.” (247) Which is more unforgivable: the affair or the confession? What are the repercussions of each of these indiscretions? Consider Libor’s mental state throughout The Finkler Question. How does he express his grief over losing Malkie? Why does he attempt to date women while in mourning? What, in the end, drives Libor to suicide? Is his suicide an act of love, of defeat, or something else? Near the end of the novel, Treslove encounters two people from his past: “the schoolgirl in his once recurring dream” who calls him a “freak” (299), and the “grizzled warrior Jew in the PLO scarf” holding a silent vigil outside the museum. (303) What impact does each of these characters have upon Treslove’s state of mind? Why is it significant that Treslove confronts two recurring characters in these final scenes? The Finkler Question ends on a scene of mourning: Hephzibah lamenting Libor’s death and the end of her relationship with Treslove, and Finkler “mourning the Jewish people” as a whole. (307) Why does this humorous novel end on a note of mourning? What is the tone at the end of the novel? What issues are resolved, and what remains unresolved? Discuss the use of humor in The Finkler Question. Is the novel’s humor specifically “Jewish humor,” or does it have broader appeal? Which scenes best represent the novel’s dark sense of humor?